Leslie Basham: Here’s Yvonne Welch. 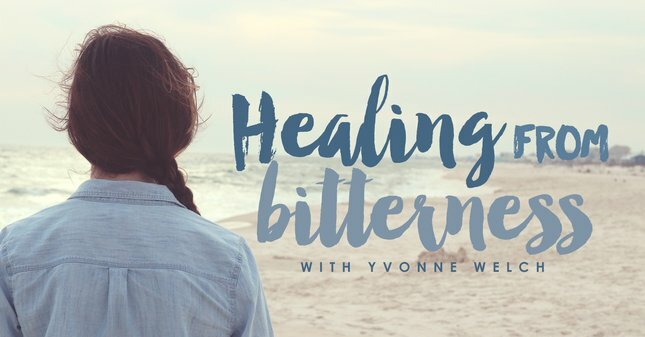 Yvonne Welch: Bitterness is something you don’t just pray a prayer and it goes away. Every day we’re going to be faced with something that could turn into bitterness if we don’t get it right then. It’s like if you get cut and you don’t take care of the poison. That wound becomes infected if you don’t cleanse it out with forgiveness. Leslie: This is Revive Our Hearts with Nancy Leigh DeMoss for Wednesday, July 31. This week Yvonne Welch has been sharing her story. As a busy wife and mom involved in ministry, she found herself under tremendous stress. This affected her health, her emotions, and her relationship with God. One of the biggest results was bitterness that crept into her life. Yvonne is back today speaking with our friend Holly Elliff and our host, Nancy Leigh DeMoss. Yvonne picks up her story. Yvonne: I remember hearing the story of Corrie ten Boom when she was in a church. She was speaking there in Munich, and I’m sure you’ve heard this story many times. Nancy Leigh DeMoss: It’s worth retelling. Remember, Nancy, what Corrie said? Nancy, that story touched my heart so much. It’s not only with a husband and wife. I believe that we must learn to forgive in all relationships in life. The key to overcoming bitterness is forgiveness. Nancy: Yvonne, that is such a huge need, I believe, in the majority of Christian women that I meet. In fact, that’s why I’ve written a book on the subject of forgiveness, because I was seeing how this root of bitterness was destroying hearts and marriages and homes and relationships. It’s almost as if almost any presenting problem you can talk about in relationships or in so many issues, including much (not all, but much) depression—so much of it goes back to these roots of unforgiveness that have created this poison of bitterness. As you think back on your situation, what was the object of your unforgiveness? Who did you need to forgive? Yvonne: Nancy, I didn’t need to forgive God. I was very blessed to have a very godly father, so I have always sensed God’s love. But I needed to forgive Bob, because at that time I really felt that he didn’t understand that I felt that living on faith was just too, too hard. I believe it does take grace. I don’t think we can forgive on our own. I think it’s a supernatural grace that comes from God. Nancy: Yet we have to be willing to lay down our right to be bitter, our right to punish the person that we feel has wronged or wounded us. We need to cooperate with the Spirit of God. Holly Elliff: And really, to get honest about what’s going on in our heart. You said a minute ago, “I didn’t want my children to know this.” So in trying to cover that bitterness so well, you were also living a lie about what was really there in your heart, and that’s part of what God had to root out. Yvonne: It is. I think that bitterness is something you don’t just pray a prayer and it goes away. Every day we’re going to be faced with something that could turn into bitterness if we don’t get it right then. Nancy: And it's true nowhere more than in marriage and family. I remember a friend of mine, a couple who were friends of mine, but the husband saying that hardly a day goes by in their marriage when they don’t have to, one or the other or both, forgive something or seek forgiveness for an offense. Holly: It really goes back to the Scripture you mentioned a minute ago, Yvonne, about not letting the sun go down [on your anger]; keeping short accounts on those things in your life that could potentially cause bitterness or anger, but they don’t have to. Yvonne: Oh yes, Holly, and for the last thirty years, we have tried to not let the sun go down on our anger. Nancy: I want to ask you, before you get to that, were you telling Bob what was going on in your heart as God was revealing the bitterness, you were confessing it, you were starting to walk the pathway of forgiveness? He would leave me with some assignments. He would leave me with some Scripture to memorize. He would leave me with some things to think about, and his encouragement. And he’d say, “Okay, let’s just go in the living room and jump rope.” We would go in there, and he would jump rope with me, and he would encourage me, and God used that. Holly: I’m wondering, Yvonne, if you had to get over the hump of that initial forgiveness to be able to receive that from him, to be able to receive his input into your life. Obviously, you’d gotten to the point of forgiving him somewhat, or I don’t know if you would have been able to hear that from him. Yvonne: You’re right. It was about the third year of my depression, and I was truly spending time in God’s Word. I was hanging on to God’s promises. I was memorizing Scripture. God was showing me that I was very fortunate to have a man like Bob. Holly: So the things that you maybe resented in those early years, that led to the bitterness, now are the things in Bob that God is using to help you out of the bitterness. Nancy: Did you at some point go to Bob and ask his forgiveness for the bitterness and anger? Yvonne: I did. He was so excited, because Bob feels that God is in your problem and God is up to something and God is up to something good. That’s his motto. Nancy: So he believed that about what was happening in your life, too. Nancy, because of that, God began to turn my heart to Bob. God began to give me the true kind of love—not the Hollywood kind, but the agape love. I love Bob’s definition of that. It’s “giving without asking anything in return.” It’s doing what’s best for a person regardless of how you feel. For four years Bob discipled our children. He encouraged us. He encouraged me. He never, ever gave up, and he showed me agape love. Nancy: He was a picture of God’s love for you. Holly: I love hearing that, Yvonne, because I’m thinking about you talking earlier about his desire to live by faith, to be like George Mueller. God allowed him to exercise that gift in that he had faith that God was going to bring you out, that you were going to respond to the Lord. He could see that far beyond where you could at that moment. You couldn’t see it yet, but he could. Nancy: And God did do a miracle in your heart and in your marriage. It was over a period of time, but my guess is that even as that restoration came about, that wasn’t the end of it. You’ve now been married forty years . . .
Yvonne: Yes; forty years July 23 this summer. Nancy: And I’m assuming you still have things you’re learning about your husband that you didn’t know, or areas where you could be offended, where you could become bitter, where you could pick up an offense. Really, forgiveness has to become a way of life. Nancy: Can you remember the last time you had to forgive Bob? Nancy: So you have to keep current. Yvonne: Yes, you do; you really do have to keep current. Nancy: Do you ever find yourself slipping back into, or have you over these years found yourself slipping back into that old pattern of responding with anger and bitterness, like heading down into that slippery slope? Yvonne: No. I can tell that I could go there. I know that’s my weakness, so I want to be shored up. Nancy: How do you do that? Yvonne: I do that by time with God—that time I spend with the Lord in the mornings. I do that by getting out and exercising. I exercise still. I believe that as we walk, God is able to heal my heart. I can share my heart with God, and God can help me think clearly as I’m walking, as I’m exercising. I believe that marriage is like a beautiful rose garden. I love to garden. In order to have beautiful roses, in order to have beautiful vegetables, you must care for it. You’ve got to tend it. Nancy: Keep out the weeds. Yvonne: Keep out those weeds. And you can’t just chop those weeds off. You’ve got to pull them up by the root. In order to have a beautiful marriage . . . We’re going to reap what we sow. If we sow love and kindness and gentleness, then hopefully that’s what we will reap; but if we sow anger and criticism and bitterness and unkindness and a lack of forgiveness, that is what we’re going to reap. I think it is so important that we ask God to help us become virtuous women. The original root word for virtue is “to endure, to overcome.” I think that as we ask God to help us be that virtuous woman, then we can invest in the life of our husband. “Where your treasure is, there your heart will be also” (Matt. 6:21). It’s the same in marriage. I encourage young women who come to me for counsel: I’ll say, “How long has it been since you fixed your husband’s favorite meal? How long has it been since you wrote him a thank you note?” Do something kind for your husband. Nancy: Which is one thing when your husband is that bright spot in your life and can do no wrong, but when you feel hurt or wounded or misunderstood, that takes faith and humility. Nancy: Maybe they’re a single mom. Holly: Maybe they’re a single mom with children. Yet these principles apply to our life wherever we are, whatever our life circumstance currently is. If we know we have bitterness and anger, God is still the same God regardless of our circumstance. It’s easy to get in those tough circumstances that you found yourself in, Yvonne, and think, “God’s mad at me. God hates me. God isn’t anywhere involved in this.” Or even to resent God, to be bitter toward Him, as so many are. But if you can see that those circumstances in your life are an expression of God’s love and God wanting to draw your heart to repentance so that you can, in humility, reach out to Him for His grace . . .
Holly, as you and I have talked and lived through a lot of life together, over twenty-some years, I think the message we have come back to again and again and again in our own experience is the grace of God. The grace that God has available. The grace that God had available to you, Yvonne, early in your marriage. You didn’t see it; you didn’t receive it. And since you didn’t receive it, at that point a root of bitterness sprang up. I can’t stress enough that at every juncture of life, we either receive God’s grace or we do what Hebrews 12:15 says, we fail to receive God’s grace. If we receive God’s grace, we have the desire and the power to respond in a Christlike way to difficult husbands, difficult children, no husband, difficult job, disappointment, financial stresses, physical issues. We can respond in a Christlike way if we receive God’s grace and cry out and say, “Lord, I need You.” But if we don’t receive God’s grace, we try and handle it on our own. Yvonne: We can’t do it. Nancy: We can’t do it, and that’s where the anger comes in. That’s where the bitterness comes in. And that root of bitterness, Yvonne, as you have illustrated so powerfully, is so poisonous, so destructive. It’s a mercy of God, and I know you would agree, that you and Bob have been married forty years. Yvonne: It is; yes, it is! Nancy: And it’s Bob receiving God’s grace to deal with a wife who was angry, depressed, and bitter. Holly: To keep loving his wife. Nancy: To keep loving. Maybe we’re talking to a woman whose husband is the angry, bitter person, and that wife needs to become the encourager, the one who prays, the one who is long-suffering. Anywhere you are in that cycle—the offended, the offender, the bitter, the one who is being sinned against—you’ve got to get to God to get His grace. Holly: You may be a woman God intends to come alongside that single mom, that single woman, and lift her arms so that she can hear God in her life. Maybe you’re going to be the encourager, like Yvonne is to so many women in her life. Nancy: And even the woman, Yvonne, that handed you that poem that’s become such a meaningful part of your life. Don’t underestimate the value of a simple act of kindness, a simple word that you may speak to someone that would be a word of encouragement or hope. In fact, that’s what the writer of Hebrews says right in this context of bitterness: “Therefore lift your drooping hands and strengthen your weak knees, and make straight paths for your feet, so that what is lame [what has been put out of order by God’s chastening, disciplining hand] may not be put out of joint but rather be healed” (Heb. 12:12–13). That is what God has done for you, Yvonne, and that is what God has done at points in my life, at points in your life, Holly—the healing hand of God. It’s His Word; it’s His grace; it’s His Spirit; it’s His people that He uses; it could be a godly mate that God uses—all so that we can be partakers of God’s holiness so that God can be glorified in our lives. I don’t know where you are in this process as a listener today. God knows your name. He knows your story. He knows where you are right now. He knows what you’re doing. He knows the roots, the seeds of bitterness or anger that may have become lodged in your heart, maybe just for a few hours or maybe it’s been days or weeks or months, or in some cases even years. Holly and Yvonne and I just want to reach out to you in the name of Christ and plead with you to get to God for His grace. Take a step. Take the next step. We’ve talked about some practical steps in this series. If you haven’t heard the whole series, you need to order the CD, or go to ReviveOurHearts.com. You can listen to the entire series, you can read the transcripts there, and we have some other resources that we’re offering—a book that I’ve written called Choosing Forgiveness: Your Pathway to Freedom. I want to urge you to get ahold of something that will help you. Open the Word of God. Do what Yvonne said earlier in this series: Go to the book of Psalms and let God show you His character, and let your mourning and heaviness be turned to joy and fruitfulness and fullness. It may not happen overnight. Yvonne, in your life it’s been quite a process, and it’s an ongoing process of maintaining that forgiving spirit, not letting anger or bitterness get a root in your heart. I don’t know about you ladies, but I find that sometimes it’s been a matter of minutes; I can just see those seeds taking root in my heart. It can happen so subtly with a co-worker or a family member, something you weren’t expecting. Holly: It’s a lifelong process. Nancy: It is a lifelong process, and a lifelong commitment to keep that garden free from the weeds of bitterness and anger and to keep forgiveness growing there. I want us to pray. We want to pray for you, not knowing who you are or what your situation is or where God has you in this, but we believe in prayer here at Revive Our Hearts. God has used prayer many times to set us free, and we want to pray for you. Ask God to forgive you for that root of bitterness, for that anger, for what maybe has become a hard heart toward Him or others. Then would you receive God’s grace? Would you ask Him to fill your heart with His love, His forgiveness, His mercy, maybe toward the people who have most hurt you, toward an ex-mate, toward a stepchild, toward a parent who hurt you so deeply? You’ll never be free until you let go of the bitterness, put it away, and in its place receive God’s grace and His forgiveness. Leslie: That's Nancy Leigh DeMoss talking with Yvonne Welch and Holly Elliff. Count on it. You can have the kind of freedom Nancy's been talking about. In Nancy's book, Choosing Forgiveness: Your Journey to Freedom, you'll read about the "trapped" feeling of bitterness. You'll see how serious unforgiveness is, and what a big effect it can have on your life. Nancy will also show you how to find freedom. She'll help you study what God's Word says about forgiveness. She'll walk you through steps of completely forgiving those who have wronged you. You'll learn to walk day by day in freedom. We'd like to send you the book Choosing Forgiveness when you support Revive Our Hearts with a donation of any amount. Ask for it when you call 800-569-5959, or visit ReviveOurHearts.com. Please be back tomorrow for Revive Our Hearts.